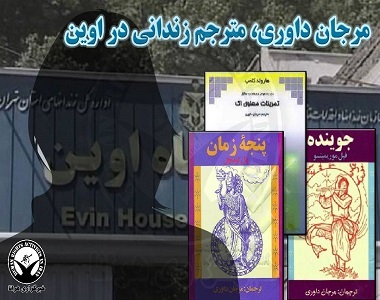 HRANA News Agency – Marjan Davari, 50-year-old scholar and translator was arrested by security forces and is kept in the women’s ward of Evin prison. Despite over 10 months of detention, her hearing has not been held and the charges against her are not known yet. According to the report of Human Rights Activists News Agency in Iran (HRANA), Marjan Davari was born in Tehran on April 24, 1966 and completed her primary education in England and in Iran in the International Gifted School of Parthian. She got an English diploma at the age of thirteen. She continued her studies in Al- Zahra University with very good grades in the field of graphics and drawings as well as research and translations in the esoteric science and ontology of East and West. Her published translated works include Talons of Time of Paul Twitchell, The Seeker of Phil Morimitsu and The Spiritual Exercises of ECK of Harold Klemp.